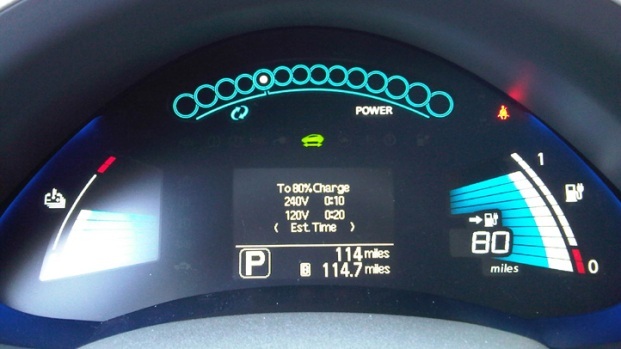 More than a year ago, I wrote about reserving an all-electric Nissan Leaf. Despite reservations about space for our kids' stuff and "range anxiety" (the fear of running out of electricity on the road), my family took delivery of the car Friday. First, the positives. The car has a lot of pick-up. I'm not talking about compared to other alternative fuel cars; I'm talking about any car that seats a family of four. The electric motors provide tons of torque, and there is no shifting gears to cause you to lose momentum. In a test by John O'Dell of Edmunds Auto Observer, it went from 0-60 mph in 7 seconds. That's quick. Faster than the Mazda SUV it is replacing. Quick enough for me to challenge a buddy with a full-sized Dodge Ram truck to a race, in a place where racing is legal. The Leaf is also smart money-wise here in San Diego. The car has a sticker price of $32,780. We leased so federal government gave us a $7,500 rebate before we even finished the financing. California then offers another rebate of $5,000. The application process was all online and easy. We're already approved and expect our check in about three weeks. Then there is electric vs. gasoline. San Diego drivers pay higher prices than most, making this an easy argument. Consumer Bob said Monday the average price of gas in San Diego is $3.93. We are paying an estimated $1.64 per 100 miles. That means to fill the Mazda CX-9, we paid about $70 and drove 320 miles. 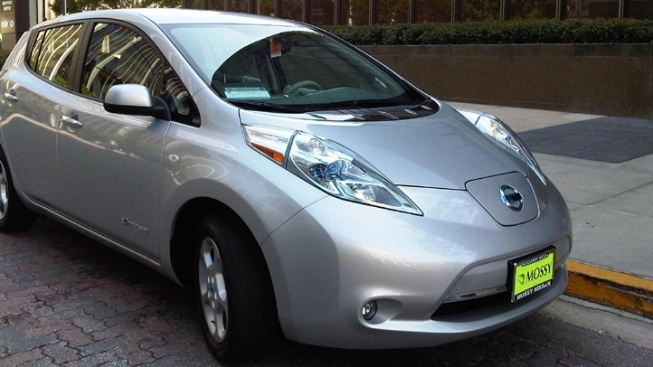 In the Nissan Leaf, that same 320 miles will cost an estimated $5.25. That's a lot of money I can spend on golf and the wife can spend shopping. It's got some really cool features. Geek out on a system that allows you to charge it remotely using an iPhone app. Play music wirelessly with bluetooth streaming audio. It even charges the interior electronics with a solar panel on the roof. Trust me when I say it's a cool gadget. Now, the negatives. This car is ugly. Really ugly. Conceal-your-identity-from-your-friends ugly. My wife is not happy about putting her vanity plates on this shiny silver pig. And it's really heavy. A lot of batteries mean the tiny Leaf weighs 3,500 lbs. That's similar to the weight of our 4-door Infiniti G-35, with a big V-6. It's pretty small; there is plenty of room for four adults or, in our case, two adults and two car seats in the back. But there is only about 4 inches between the seats, which isn't nearly enough if we run short on snacks for the kids on the way home from preschool. The back hatch will hold a stroller, two rollerbags or maybe three sets of golf clubs. Boxes, dogs, ice chests and jogging strollers are definitely out. Trips to the airport to pick up two people and their luggage would also take a considerable amount of planning and logistics. So does it work? Yes. It is a top-of-the-line gadget that saves you real money and is likely good for the environment. For all the negatives, it is proving to be a great car to navigate our 30-mile roundtrip commute. We were worried about safety, but it is pretty safe. All that battery weight in the floor makes it feel like you are driving a tank, and it scored well in crash tests. So did we need it? Yes. It is saving us a lot of money while driving pretty much like our other vehicles. The big negatives (ugly and small) don't outweigh the positives (quick, efficient and stacked with electronics). We have it for the life of a three-year lease, so we'll see how it works over the long-haul, and I'll write again with any big changes.